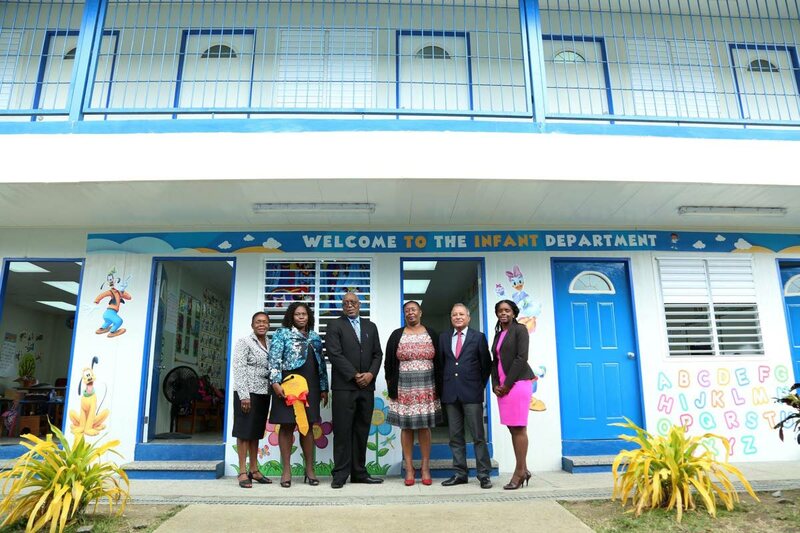 Chief Secretary Kelvin Charles, third from left, and Chris Jagroop, second from right, acting Chief Executive Officer, Udecott, stand in front of the newly constructed annex at Whim Anglican on Tuesday. Others in photo are from left, Karen Boatswain, School Supervisor II, Division of Education, Christine Benoit, Principal of Whim Anglican, Jacqueline Job, Administrator, Division of Education, and Janelle Berkley of Udecott. Keys were handed over to principals of four primary schools last week Tuesday upon completion of annexes under the Expansion Programme. In 2016, then Secretary of Education, Huey Cadette said the Division had received requests from four primary schools for expanded facilities - Hope Anglican School, Whim Anglican, Patience Hill Government and Signal Hill Government. Cadette had said then that with the support of the Urban Development Corporation of Trinidad and Tobago (Udecott), the Division had embarked on a project to expand the facilities, that the duration would be three months and the budget was $19 million. On receiving the keys, Principal of Hope Anglican School, Isabelle Burris-Paul said she was happy with the comfortable with the additional space provided by the annex. “All we can see are endless possibilities and numerous positive outcomes as we are now poised to enter unchartered waters and fully explore all that the world of learning has to offer in a comfortable new environment, an environment that is not without its challenges, but one that affords us opportunities that we never had. We plead with everyone here… stand with us, stand by us, stand for us because team work makes the dream work,” she said. “…so, at the end of the day, these students would blossom and of course get to that level where whatever skills they acquire, whatever talents they do possess,that we ensure that those talents are nurtured. 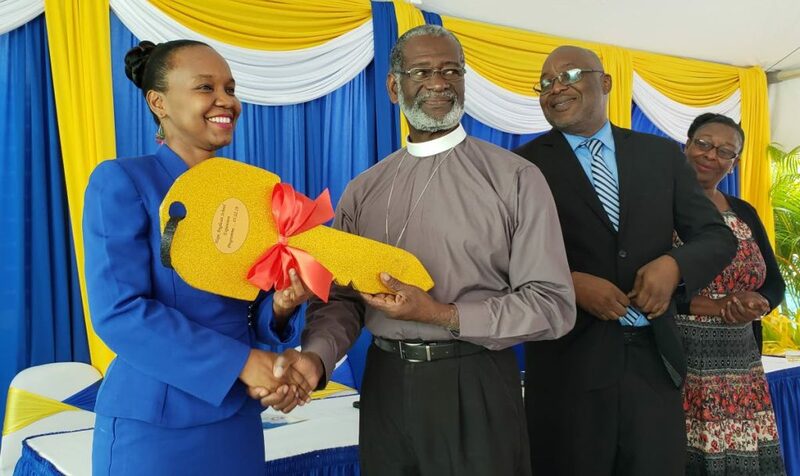 Principal of the Hope Anglican School, Isabelle Burris-Paul receives a symbolic key to a new annex to the school from Head of the Anglican School Board, Archdeacon Phillip Isaac last Tuesday. Looking on is Chief Secretary Kelvin Charles and the Division of Education’ Administrator, Jacqueline Job. “As we improve the environment, I am happy to say that the learning environment of the child is consistent with a reasonable working environment of the teacher and therefore to who much is given, much is expected,” Charles said. Administrator in the Division of Education, Jacqueline Job, also spoke at the event, saying the school’s expansion was borne out of the vision of the Tobago House of Assembly to provide housing for all. “This commissioning is a true testimony of the leadership of my Secretary, the Chief Secretary and Secretary for Education, Innovation and Energy, Mr (Kelvin) Charles and therefore it is clear that the expansion of this school represents the Division and the Chief Secretary’s vision for an enhanced physical environment which equals an enhanced learning,” she said. Udecott Director Janelle Berkeley said Hope Anglican’s expansion comprises a completed two-story building with a structural steam frame and roof which houses additional classrooms and an airconditioned staff room to accommodate an increase in students. She said bi-fold doors were incorporated into the design to allow for increased space, should there be a need. “The walls for both the two-story structure as well as the toilets were erected using pre-fab systems, which allowed for easy installation and modification for electrical and plumbing installation. The finishes for the project comprised of terrazzo floor finish for the various rooms within the building, which allows for easy cleaning and overall maintenance. Additionally, rail works were installed to ensure the overall safety of the students,” she said. Reply to "Four primary schools get expanded facilities"